"Where does complicity intersect with responsibility?" asks author Paul Fleischman in this small yet weighty essay and poem about the Buddha's teaching on nonviolence. 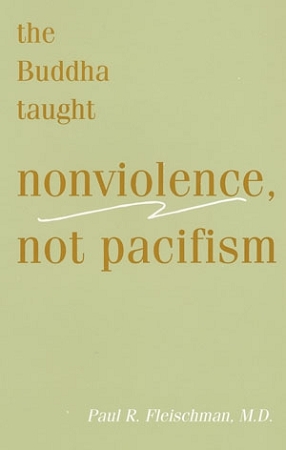 Written in the wake of the events of September 11, 2001, it examines the prescription of the Buddha: not war, not pacifism either but nonviolence. This eBook is in PDF format, which can be read on any eBook reader which can display PDF files, and on computers. "Nonviolence as the Buddha taught it was directed at each interaction in each moment but was not a comforting myth for denying inescapable truths. Dhamma is a long path, a footpath, culminated by only the rare few, and not a fantasy exit from the exigencies of the human condition. There are no global solutions even hinted at anywhere in the Buddha's dispensation of Dhamma. His followers practice nonviolence because it anchors them in alertness and compassion, expresses and reinforces their own mental purification, builds identification with other beings -- human, animal, even seeds; and because it is their more cherished realization: mind matters most. Cultivation of love, peace and harmony is always the only irrefutable doctrineless meaning that people can experience." This is indeed a sublime, profound and potentially life altering approach to a question that typically begs hackneyed, politically correct and shallow responses. Here is a teaching that each individual can embrace and build into his or her spiritual practice and growth. I recommend this book with all my heart to all who are courageous enough to make their own decisions and choices and not to seek an "ultimate truth" and simple answers from an outside source.